Costs, Summary and Review – Do your dream! Total cost: €7,278; €54.72 per day or around £46.61 per day. Total mileage: 6,800 at just over 35mpg. For this trip which had many different elements we have summarised separately below. Our most expensive trip to date but considering the costs of the Morocco tour as well as our campsite for snowboarding and our lessons, passes etc, I think its been outstanding value. Where else could you do everything we’ve done on this trip for under £25 per person per day? Astounding! We thought we were well prepared for this trip, but from the outset it was clear that the trip was going to be tougher than we imagine d and it was clear we were going to have some problems. All part of the adventure! Despite our preparation, in the extreme cold we did get frozen pipes and window washers, and even some pipework from the fresh water tank (heated) to the boiler froze meaning internal water would be a problem. In addition the waste was frozen solid at -18’C so I don’t suppose we could expect anything less. Fair to say – much beyond -10’C is a problem for our van water system. We opted to drain it down, disable the pump, and just use washing up bowl and a fresh water container. Annoyingly however, the majority of the time the temperature never dropped below -10 or so, and thus we’d have actually been okay. Did we react too quick? Should we have waited? Don’t know – but as it wasn’t too inconvenient the prevention of frost/ice damage made us feel a bit better. 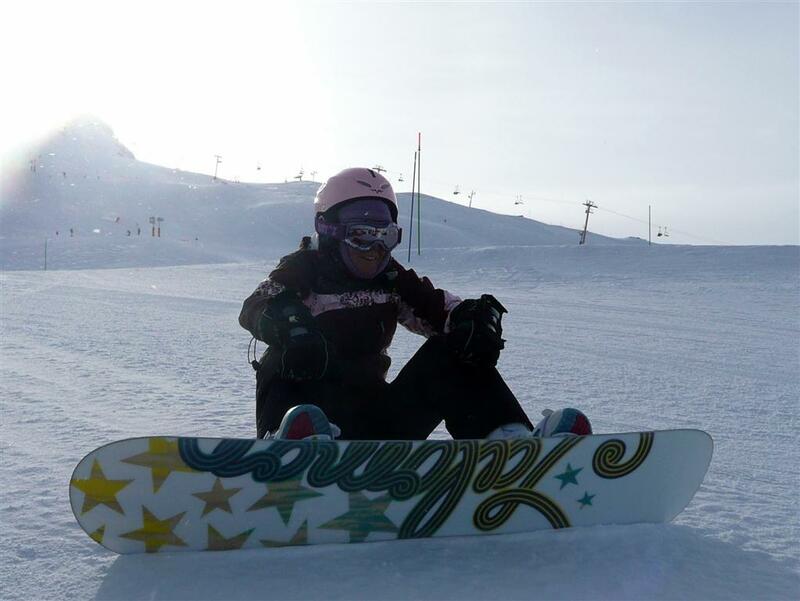 If you are a novice skier or boarder and fancy a long stay, or you are more experienced and fancy a shorter stay, then there is little we can say apart from you should consider Valloire as a destination. We’ve written about the place elsewhere on this trip blog, but really we can’t find anything that we’d realistically want to change with the place. Seized rear brakes (after being left in Alps for 6 weeks). Fixed by removing wheel and freeing drum with hammer. Dripping tap pipe. Fixed by tightening up. 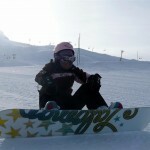 Well, without repeating ourselves, Valloire is a superb place to snowboard. The campsite is okay, the ski area big enough to play on for a long time, the queues virtually non-existent, and above all Valloire itself is a genuine town and isn’t a typical modern/dull resort. It suited us down to the ground. Our only real complaint is the fact we hardly had any fresh snow. There was sufficient to play on every day, but a couple of runs were too icy for boarders of our level, and the hard-packed/icy/man-made snow wasn’t great. This sadly affected all of the Alps this year which is a shame. Value for money and location get 9/10, but overall we’d give it 7.5/10 just due to the lack of snow. They did the best they could with what nature provided and if the snow was better it’d easily get 9/10 or above. 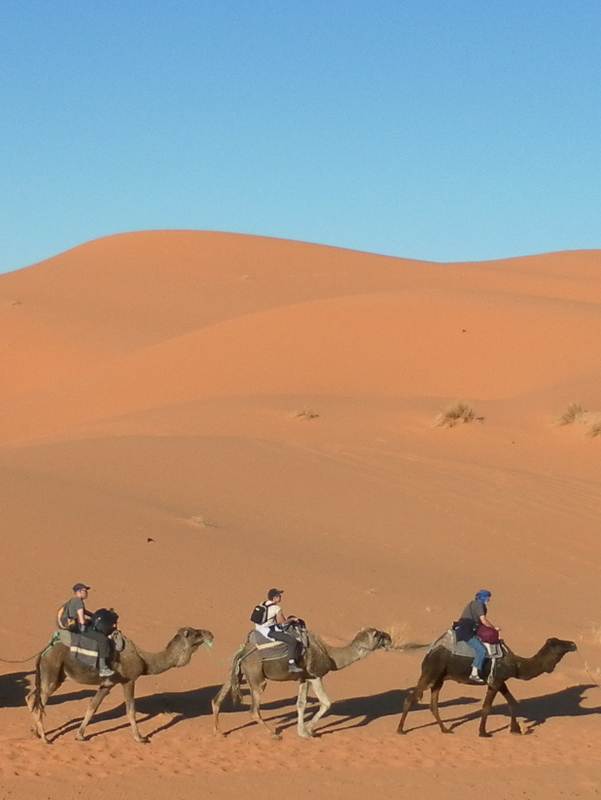 Considering we don’t like guided tours; we don’t like groups; we like doing things our way; and we hate being hassled – its quite a surprise we booked a guided tour of Morocco with Desert Detours! However, as it turned out, some friends we knew also came along as did my parents who we invited. Morocco exceeded all expectations. By far. To be fair we didn’t do much research (if any!) in order to maintain a surprise, but we were positively stunned along the way. The vast majority of people are friendly and welcoming; most children want to simply smile and wave; and even the sellers/hawkers/traders weren’t as much bother as we expected. Granted we were hassled by a few kids and a few hawkers, but not to the extent it ruined anything and most will go away after polite but firm “no”, then simply ignoring them. The sites and views we saw were truly spectacular – we pretty much enjoyed every second. On most trips we experience “wow” views or activities maybe once or twice a week, but in Morocco it was easily that every day. Morocco is a stunning country, friendly people and interesting history. Ray and his team at Desert Detours had their work cut out with so many different people who each have different needs and expectations. In our view he did the best possible to appease everyone even though it would be impossible for anyone to make everyone 100% happy. For instance, the Fes tour wasn’t great for us but others enjoyed it, but probably the tour was the best (and only?) way to see what we did in Fes in a short space of time. Some people want to be told exactly what to do and when, and others (like us) prefer pointers and a bit of adventure. The guys did seem to be on constant watch to ensure everything was smooth, and whilst not everything was perfect, considering we are in Morocco, Africa, what do we expect! The group was a mixture of people, I was the youngest as usual, but we’d say the group gelled very well and there were no real cliques and everyone socialised with everyone else with people happy to sit with anyone around the campfires. Most people appeared to be enjoying themselves. Could you do Morocco alone? Yes – for sure. But as I’ve mentioned elsewhere, I’m certain we would not feel the same nor get the same experience as we did on the tour. Everything considered I think the tour was good value for money and we are very glad we did it. The additional things we did, live 4×4 and Camel rides were fairly priced, and the group meals over campfires gave a fun insight into others interesting lives and adventures. Campsites in Morocco are below par – we mainly used our loo/shower and we assumed all tap water is not drinkable regardless how it is marked. We cleaned our tanks when we got back to Spain using some of Zappys pills. Electric is iffy, so you may only get 180v rather than 240v which confuses some fridges and it means some 240v things, like fan heaters or kettles, would not work well. Some people did use the facilities okay, but if you can consider campsites as just aires and then you won’t be disappointed and may get a pleasant surprise. Wild camping doesn’t seem popular in the areas we covered and I’m not sure we saw many suitable locations, especially in East and Central Morocco. I would guess it isn’t as easy as Europe and you are more likely to get problems. We love wild camping and I’m not sure we would much in Morocco. We are aware many people spend a lot of time in Morocco and wild camp there but this does seem to be restricted to the coastal areas. If you want a different type of sun/beach holiday then I’m sure you could do this – especially from Essaouira south. We saw very few (e.g. single figures) of motorhomes wild camping on our route and very few potential spots. In our view, sticking to the coasts isn’t actually seeing or experiencing the real Morocco which we were privileged to see. 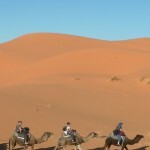 If you are considering a trip to Morocco, do consider a guided tour – you will get more out of it. And we would recommend Desert Detours. However, you should not expect to be hand held, nor expect to be told what to do and when. They run the tour as guides and suggestions and expect you to be able to think for yourselves. They do not run it in a regimented “club” type event. Their way suited us and our approach but may not be suitable to others who depend on being told everything in minute detail and don’t like thinking themselves. We’d give them 9/10. The coastal areas seem to be more liberal and European compared to central Morocco, so if you’ve only ever done the coast then you’ve not really seen anything. Overall for Morocco, including the experiences, sights, people, adventures, company, food, camps etc – we’d be hard not to give it 9.5/10. It was, quite simply, spectacular and awesome. We suggest you go before it gets too “Europised” – as at the moment its probably the most unique place you can easily take your campervan, motorhome or even caravan. After our last trip to Spain and Portugal we didn’t plan to go back so soon and only did because of Morocco. We prefer Portugal to Spain but haven’t fallen in love with either of them really which is a shame. This trip though showed up some lovely places in both countries – and away from the tourist centres of the Costas Spain does have some lovely little places inland, and the north coast has some spectacular landscapes and little coastal villages. Portugal too has a huge variety – and inland is vastly different to the Algarve. Portugal is more wild-camping friendly than Spain, but this appears to be changing for the worse though its easy to see why. Anywhere nice doesn’t have 2 or 3 vans, it may have 50-100 – and that is in March and April which is hardly peak season – many staying there for months on end and some (not all) making it look like a pikey site. We can see why people go there, and even why people stay for a long time free next to a beach, but for some reason we can’t really explain – we like it but don’t love it, so whilst we may visit again it won’t be for a while. What an excellent use for a campervan! This trip took well over 1/3 of the year, we did awesome and very memorable things, exceeded our expectations, and just had a great time. Okay it was an expensive trip, but look how long we were away, and look at what we did. It’d be hard not to say, overall, 9.5/10. EXCELLENT!! !